A zebrawood master bath takes its theme from the striking veneer on the vanity. Last week I featured a dramatic Zebrawood Kitchen in a historic townhouse. I also discussed using this exotic wood for countertops and accents. 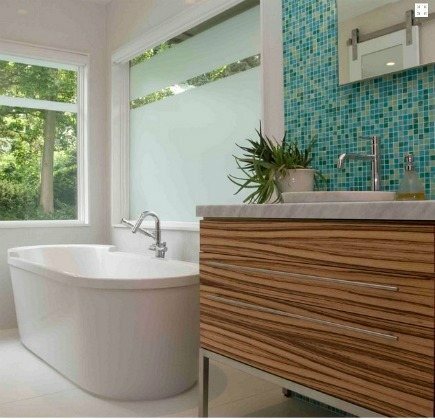 Today, I want to share a contemporary zebrawood master bath made from the same dense material. Zebrawood, also called zebrano, is an African hardwood. Dark, zebra-like stripes in the grain are a major characteristic and their appearance can vary between flat sawn or wavy stripes and more uniform quarter sawn stripes. Strong and dense, this exotic wood is highly suitable to wet and damp locations such as bathrooms. The veneer was used to create a custom furniture-style vanity consisting of four drawers on a stainless steel base. The long stainless vanity handles fade into the horizontal striations in the wood. One large corner window, in front of the tub, was designed with a positive-negative frosted treatment to provide privacy on one side while , providing privacy on one side while preserving a view of the garden on the other. The Duravit freestanding soaking tub has a Lacava tub filler. Both rest on Bisazza Logos Terrazzo floor tiles. 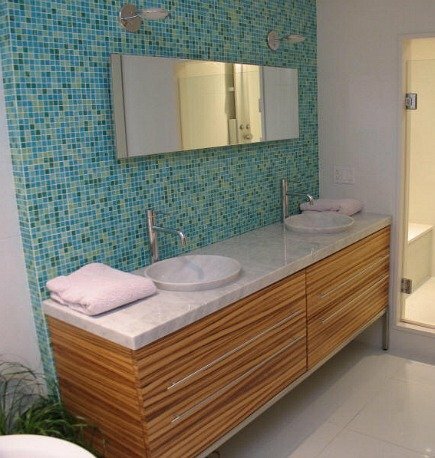 Bisazza glass mosaic tiles (1-inch dots) in a mid-century variagated aqua pattern accent the vanity wall and provide a colorful background for the Cararra marble counter and vessel sinks. They make a uniform and colorful background for the medicine cabinet and a stable base on which to mount wall sconces. We’re also able to catch a glimpse of the walk-in shower and its bench seating, also tiled in white to keep the eyes on that fabulous wood vanity. Love the zebrawood vanity! Just Gorgeous! I don’t know if I love it with the glass mosaic, though, at least not in the colors they used. Those are pretty ‘Look at me’ colors, and the zebrawood should get the stage solo. JMHO. Still it’s a stunning bath. Thanks for sharing. how do I find aa vanity like the one you are showing? You could contact Wright Works, the company that did the remodel.